The outstanding properties of ceramics have guaranteed their use for millennia and they remain vitally important in modern technology. 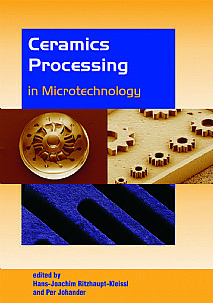 This book provides an overview of the current status of processing of ceramic materials in micro technology. Emanating in part from scientific partners in the ceramics division of the 4M Network of Excellence, the book deals particularly with micro manufacturing and applications of ceramic materials. The book covers the spectrum of topics from design, through material development and synthesis, to microforming, thermal processing and metrology strategies, including characterization, quality control and the dependence of properties upon processing and microstructure. Processing technologies form a significant part of the book, and include replication techniques, tooling and mould fabrication and also special techniques such as embossing, electrophoretic deposition, high-pressure injection moulding and prototyping. Subtractive and additive process technologies are dealt with, before the book concludes with sections on quality assurance, metrology, and test equipment for micro components. This is a wide-ranging and comprehensive volume which will be a vital state of the technology review for anyone with an interest in ceramics, particularly at the micro and nano scale. The book will be especially valuable for scientists and technologists in materials science and technology, process engineering, micro systems and nanotechnology generally. It will also provide an up-to-date synthesis for students in these and related disciplines.